Yesterday I saw on Facebook a post of an event at the Charlotte Street Arts Centre which is just a few blocks a way. It sounded fun, a crash course in Silk Screening to create t-shirts to support their upcoming Emerging Musician series on Thursday evenings. The Centre is an amazing place, "opens the door of creative expression to all." There are artists in residence, music and dance programs all held in a building with a rich vibrant history. Walking along the tree lined streets up to the Centre I was reminded again of the beauty and history of Fredericton. The Centre dates back to 1884. 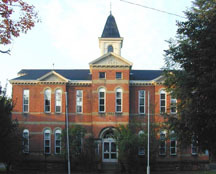 It was originally built as a school with six classrooms. Chalkboards were discovered from a Grade 1 classroom with a class list and are now on display at the Centre. Watching the little ones coming from Irish dance and reading the list of little ones from the past, we create and live history. The silk screening crash class was taught by a talented young artist Angela Black. She explained the process of taking the drawing having it copied on the photo film, essentially like a photo negative. Placing this with the screen to transfer. Inking the screen and pulling the ink over the design to transfer it to a t-shirt. It was something I really knew very little about and now I understand the process. Plus I have a very cool shirt and supported a worthwhile program! The Centre run by two very passionate women who are bringing art t the community through the programs at the Centre and there many outreach programs.